Is This The Best Snow Blower For You? This snow blower is identical to the Craftsman 88691 except it does not have power steering. If you really like the 88691 but don’t need the easy steering this is the one! This “better” 26 inch snow blower (Craftsman 88970) will easily handle 9 inches or more snow on a 3 car drive 80 to 100 feet long. If you are replacing an older 24-26 inch snowblower you will appreciate the upgrades this one has over your old machine. What makes this snow blower “better” ? Extended chute with a lifetime warranty. This snow blower by Craftsman is a great snow thrower at a “value” price. If you follow Craftsman you know this size has been around for a few years now and is one of the best rated snow blowers on the market. It is very popular because of the features and the affordable price. This machine is a proven winner and it will last for years if properly taken care of. What you can use this snow blower for: For paved and gravel surfaces, patios, sidewalks and walkways. Will do grass pathways and trails. All types of snow including heavy, wet blizzard snow. It has tires large enough so you can go out in the back yard and clean a spot off for your dogs or make a path out to the storage shed. You can use this to clean your patio and deck and the poly skid shoes will not scratch the surface. This snow blower is a good choice if you have a stained concrete drive. It handle occasional 12 inch and deeper snow falls. The six forward and two reverse speeds will let you go slow for the heavy stuff and faster for the lighter snows. This Snow Blower Has Been Around Longer Than Most. Can You Trust It? This snow blower has been sold now for at least 4 years and has a proven track record of being a very reliable and capable machine. This snow blower is one of the best Craftsman has ever sold. What you may not like: This snow blower is 26 inches wide and will probably fit through the side door of your garage. If you have to go through that side door to move snow make sure the door is at least 30 inches wide. Owners of the 4-way chute control on this unit either love it…..or hate it. What most owners don’t understand is the control is actually designed to use your hand to release the chute and your forearm to move it from side to side. [box type=”info”] In other words with your left hand reach over the top of the control handle and grasp the knob. Squeeze the red button like you are making a fist. Use your forearm to move the handle from side to side for the chute rotation and push it forward and back for the deflector. [/box] This works very well because you use the strength of your forearm to change the rotation of the chute, but it does take some getting used to. Sears is the Official On-Line Retailer: Click Here To See Current Price, Order Online, Pick Up at your local Sears store, or have it delivered to your home: Craftsman 26″ 208cc Dual-Stage Snowblower 15 x 5 in. Be Careful! This snow blower is sold through Sears and Sears.com ONLY! You may find other “factory-direct discount” stores and websites trying to sell it, but make sure they are authorized Sears sales representatives. Is This One Of The Best Rated Snow Blowers for 2013? This snow thrower has had many upgrades over the years and has been rated as one of the best snow blowers for the last two years. The drive system has been around for many years and is one of the most dependable around. The transmission is proven reliable on this size. The impeller, auger gearbox and shear pin system has proven itself over the years. Does This Get a Best Snow Blower Rating For 2013? In the Good, Better, Best rating system this snow blower rates a “Better” for ease of use, durability and long life. 4-Way remote chute, electric start, adequate engine all factor into this “better” rating. It uses a strong Craftsman motor that has plenty of power for it’s 26 inch size and 9 inches of snow. In fact the motor is one of the most dependable on the market today. Don’t be afraid to buy this snow blower if it fits your needs. Customer Satisfaction: When you go to sears.com to read the reviews of this snow thrower you will see over 4 years of reviews. Overall customer satisfaction is great but there are a few negative reviews I want to note. First, Always use a fuel stabilizer or fresh non-ethanol fuel. If you are going to leave your snow blower sit for more than 2 weeks use a fuel stabilizer. Today’s gas is designed for auto use, not for these small engines. Second, Buy extra shear pins now. The auger system is designed to be protected from damage by the shear pins breaking and if you replace one with a bolt you stand the chance of destroying your auger gearbox. Third, Get used to it before the first snow. Go out and play with the chute control, learn to start it, and practice with it. I am not going to tell you to buy a protection plan, But the Sears is the ONLY retailer that will repair fuel related problems if you have the optional protection plan. For less than the cost of one carburetor repair you can have 5 years of protection. Here are a few tips to get the best out of this snowblower. 1. Read the operator’s manual and familiarize yourself with the operation of the machines BEFORE you have to blow snow with it. 2. The 3 or 5 year home protection plan can be a great value. Sears will fix your snow blower and give the satisfaction that it will work for you for the 3 or 5 years. 3. Practice using the chute so you really understand how to use it. The deflector has a tensioning adjustment that you can change it for light or heavy, wet snow. 4. When you get your new blower home, get it out of the box, learn how to start it and use it before the first snow. Take it out and practice with it in the driveway. (If there is a manufacturing issue, you will find it now instead of when the snow is 12 inches deep.) 5. Use a fuel stabilizer like Stabil (Marine) or Seafoam. Put it in your gas can when you fill it at the pump. Value: At around $769 it is a good value. Watch for special “Shop Your Way Rewards” sales, no interest or cash back with a Sears Card, Family & Friends, and Midnight Madness Sales. Ease Of Use: This snow blower has the 4-way chute but it does not have power steering. You will like the control you get with the extended chute and the fact that snow does not blow back at you as much. This uses a “standard” drive sytem. There is no differential so both wheels drive all the time giving you the best traction. Because of this this snow blower can be hard to turn on dry pavement or in your garage. This is one snow blower that you have to “manhandle” to turn it. If you are used to this design you will get along fine. 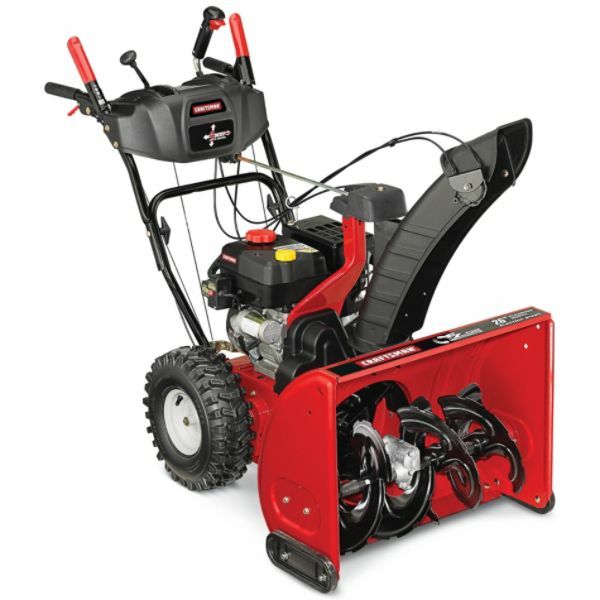 If you have back problems or a physically smaller than average I suggest buying a snow blower like the Craftsman 88691 Craftsman 88691 with power steering. It is balanced well so you if you do have to lift up the front to go over an obstruction you easily can do it. Under normal snow removal conditions you will appreciate the traction this unit has. The extended chute allows you to put the snow exactly where you want it. This 26 in. Craftsman® Dual-Stage Snowblower has a 208cc* 4-cycle OHV engine and push-button electric start. Click Here To See Current Price, Order Online, Pick Up at your local Sears store, or have it delivered to your home: Craftsman 26″ 208cc Dual-Stage Snowblower 15 x 5 in.